Help Save the Historic Gribble Barn! Purchase Photographs of the Barn! 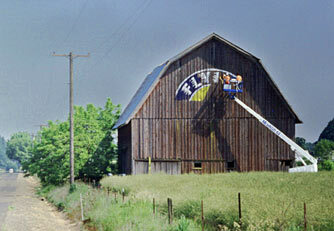 The Barn's owner was a Gribble, Mr. D. Joe Gribble, his passing precipitating the Barn's demise. Mr. Gribble's father and grandfather were both present at the barn's construction in 1907, over a century ago. New News, March 2018. The Gribble Barn's classy planks, boards and beams were purchased by a company in Redmond, Oregon and are being incorporated into new construction in Central Oregon! It's like Life After Death for the noble Barn. Click here to see a home near Sunriver Resort that is using Gribble Barn wood. Mr. Gribble owned only the structure, not the land upon which the barn sat. That land passed out of Gribble ownership in the 1950s. That caused a long series of battles to save the Barn and put it to new uses such as a venue for weddings, an outdoor farmers market, a coffee shop and more. The landowner desired the Barn go away, whereas County officials would have liked to see it stay where it was built because that is how official County historic landmark status makes the most sense. And so the magnificent barn became in a sense homeless. Negotiations continued on and off for years between Mr. Gribble and the landowners. But the Barn's fate was perched on a knife edge, perilous and uncertain. Many possibilities were explored to avert destruction. Even moving the Barn was explored but by the 2000s, the costs of doing so had become astronomical. So it was demolished and my "Help Save the Gribble Barn" plea in the Barn pictures to the left has now been silenced forever. The Canby McDonald's store has a mural inside that incorporates one of my photographs of the front of the Gribble Barn (the aspect seen to the upper left with the black vehicle beside the barn). Scroll down to see mural picture!. ...Gribble Barn Christmas Ornament: If you can find one in a local antique store, back in 2005 the Canby Chamber of Commerce sold a collector's Christmas ornament featuring another of my pictures of the Gribble Barn. Note: the Gribble Barn has appeared in a nationally distributed coffee-table book called "This Old Barn," published by Country Books in 1996. See the Barn on page 39, and note that its location is mis-labelled (the Editor promises to fix this if the book is reprinted). The barn was built on the 640 acre Gribble Homestead in 1907, replacing an earlier version dating from 1850. The barn was very large, approximately 42 feet by 65 feet, with two-story high, cathederal-like interior that was a secure home of bats and owls. Gribble Creek ran by its NW corner. Its massive timbers were milled at the nearby Yoder Mill, which to this day is a Yoder family custom timber mill whose owners are related to the Gribbles. See historic 1905 photograph of the Gribbles who built the Gribble Barn! Many believed that this Barn should merit a National Historic Registry designation, or at least a County "Historical Landmark" status. It did have a current "SHPO" number (#1984) with Clackamas County, which was a solid starting point for further efforts that never materialized. 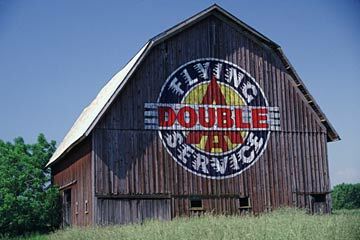 The Barn's now-famous painted logo of the "Flying Double A" dates from 1986, when representatives of Mark Coppos Films in Los Angeles struck a deal with owner Iola Bowers, and agreed to the painting of the logo for a Burger King national ad. Three Portland sign painters were hired, one of whom now lives in Pennslyvania. That's "Frank," and he is is strong in his statements that the Barn ought to be saved. Below are two of his pictures from that Memorial Day weekend in 1986 when the painting happened! 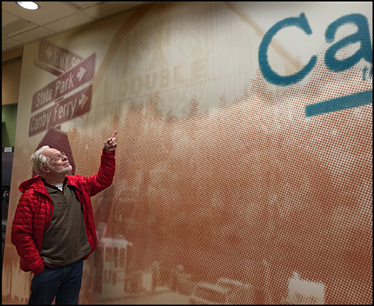 Above: my Gribble Barn image incorportated into an artsy mural inside the new Canby McDonald's on the south end of town. That's me! * Herein follows a very incomplete assortment of names on headstones within the Gribble Pioneer Cemetery, which is located about one mile west of the Gribble Barn, on the south side of South Gribble Road: John Gribble born 1799 died 6-3-1869, and his wife Elizabeth Gribble... Joseph Jackson born 8-30-1823... Mary Jackson... Catherine Fish born 1825, and numerous other ancient Fish headstones, many difficult to read... A Fish was probably the fir person to be buried in the Gribble Pioneer Cemetery; she was a toddler named Evaline O. Fish, died November 28, 1858. Evaline was born to Hanna Gribble. Hanna walked the Oregon Trail to Oregon alongside her father John Gribble, the two dairy cows, and the family's wagon. Other names are: Woodford Jesse born 1839... Henry Boggess born 1841.... George Rueck born 1856... G.A. Gurley born 9-16-1861... Edward Porter born 1870...John Kraus born 1872....Frank Jesse born 1874... . Nellie White born 1877....Gabbie White (sp?) born 1882... W.G. "Hap" Harms born 1910 and Fern Gribble Harms..also, others before 1900 include: Wesley... Hungate... Dodge... Daniel Wyland... Keiling... Howser.... At some point in the future, I will make this listing more complete and would appreciate help on the project.